Be punctual. Be disciplined. Be sincere. Be a hard worker. Be positive. Be fearless. And, respect everything that life tosses at you. These are the key lessons Indian Hockey Player, Sandeep Singh learnt from his life experiences. “Nothing can break you if you have these lessons with you,” said Sandeep Singh a.k.a. 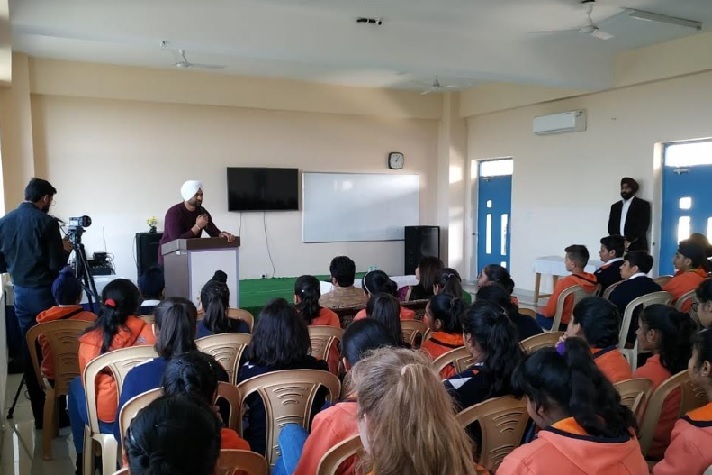 Flicker Singh, the renowned Indian professional field hockey player from Haryana as he interacted with kids from the No.1 School in Punjab, Oakridge International School Mohali, as part of a talk series called OAK INSPIREON, where experts from various fields interact with kids and inspire them. He shared his motivational life journey with the kids from how he started playing hockey inadvertently to how he became a passionate hockey player. This 32-year-old Former captain of the Indian National Team has acquired a plethora of world records and awards at a very young age. Sandeep started playing for domestic hockey teams and made his international debut in 2004. He believes that to be a successful person, you should always keep setting higher goals and aim to achieve them. "You should always keep working hard, to be on top. And even if you are at the top of your achievements, maintain the stability,” said Sandeep as he addressed a packed classroom for students. Oakridge Mohali Campus has been Ranked no 1 Best International Day School in Punjab for the three consecutive years at the Education world rankings 2018, the most prestigious rankings in the education sector today. Oakridge is dedicated to nurturing responsive and motivated students through a dynamic and success-oriented education program. The program empowers students to gain an indigenous as well as global perspective on various aspects.